Will New Meteor Shower This Weekend Sizzle or Fizzle? This sky map from a NASA video shows the location of the new "Camelopardid" meteor shower spawned by the Comet 209P/LINEAR, which will make its first appearance in Earth's night sky overnight on May 23 and 24, 2014. 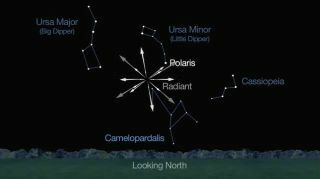 The meteor shower will appear to radiate out from a point near the constellation Camelopardalis. Meteor observing can be relaxing and enjoyable, yet it's also potentially dramatic. One of its fascinations is that meteors are unpredictable. Usually they are few and far between, but you never know for sure what will happen next. There's always a chance that you will observe something new and different, rare or unique, whether it be a new meteor shower, a brilliant fireball or a long-enduring smoke train. Comet 209P/LINEAR appears as a dim, dusty object at the center of this photo taken by NASA astronomers at the Marshall Space Flight Center in Huntsville, Ala. in May 2014. Dust from the comet is expected to create a meteor shower that will be first seen on Earth in May 2014. Comet 209P/LINEAR orbits the sun every 5.1 years, with its aphelion (farthest point from the sun) lying just inside Jupiter's orbit. It is a member of Jupiter’s family of comets, which consists of icy bodies whose current orbits are primarily determined by the gravitational influence of the giant planet. We can therefore thank Jupiter for raising the potential of a spectacular meteor shower on Saturday morning (May 24), because the gas giant has clearly shepherded 209P/LINEAR into the orbit we find it in today. Its most recent encounter in February 2012 saw the comet pass within 54 million miles (87 million kilometers) of Jupiter. As luck would have it, that 2012 encounter perturbed the comet — as well as any dusty debris presumably near it — into a new orbit that now comes within just 280,000 miles (450,000 km) of Earth’s orbit, possibly setting the stage for a never-before-seen meteor shower. Indeed, Earth will arrive at the comet's orbital plane at around 2 a.m. EDT (0600) on Saturday. Some believe that a significant meteor outburst will result. Amazingly, the comet itself will pass through this very same region of space just 3 days later! The meteoroids that crumble off a comet's nucleus form a thin sheet in the comet’s orbital plane. Whenever Earth plunges through this plane, we have a chance for a meteor shower. Whether we get a spectacular "meteor storm," a strong shower or nothing at all depends on exactly what part of the plane we go through. Editor's Note: If you capture an amazing photo of the new meteor shower, or any other night sky view, that you'd like to share for a possible story or image gallery, please contact managing editor Tariq Malik at spacephotos@space.com. Sizzle of fizzle: What might we see? Meteor experts have been working hard trying to determine just what Earth's interaction with the dusty debris of Comet 209P/LINEAR will produce. Predictions have ranged anywhere from 100 meteors per hour to perhaps a full-fledged meteor storm of 1,000 per hour. In weather forecasting, meteorologists sometimes make analog forecasts — comparing scenarios from the past to upcoming events. So I thought I might throw my own forecasting hat into the ring by trying to calibrate the intensity of Saturday's potential meteor event with one from the past, using a well-known meteor-producing comet. On the evening of Oct. 9, 1946, North American time, Earth passed within 139,000 miles (220,000 km) of the comet's orbital plane, reach this point in space 15 days later than the comet. Interestingly, that orbital geometry was not too different from what we're about to experience with Comet 209P/LINEAR. In the case of the Giacobinids, meteor activity shot up after dark and ultimately reached a sharp peak of 50 to 100 meteors per minute (3,000 to 6,000 per hour) despite hindrance by the light of a full moon! Might we expect to see a similar display this coming Saturday morning? Unfortunately, the answer is probably not. Comet 21P/Giacobini-Zinner is considerably larger than Comet 209P/LINEAR and expels much more dust into space, dust that ultimately translates into meteors. In fact, as comets go, 209P/LINEAR is a rather puny specimen, estimated to be just 0.37 miles (0.6 km) wide. That's only about 1/7 as large as 21P/Giacobini-Zinner. On May 23-24, 2014, Earth may possibly pass through the previous dust trails of Comet 209P/LINEAR. The trails of Comet 21P/Giacobini-Zinner dust that produced the dramatic 1946 meteor storm were relatively fresh, having made just two to seven complete revolutions around the sun over a span of 13 to 46 years. Meanwhile, the dust trails ejected by Comet 209P/LINEAR for next Saturday’s expected encounter have made anywhere from 18 to 42 trips around the sun over the space of 90 to 211 years. Trails of dust that have been recently released into space tend to be more densely clustered together as opposed to older trails, which have had more time to become more widely dispersed. But perhaps we just might be able to improve on those numbers. The possible reason? Jupiter! Jupiter's immense gravity keeps the dust particles shed by Comet 209P/LINEAR packed relativty close together. Somewhat similar to a cosmic game of pool, when the comet and its accompanying particles pass near Jupiter, the big planet "re-racks" the particles. Recently, while doing some orbital simulations of Comet 209P/LINEAR for the past two centuries, I noticed that Jupiter had perturbed this comet’s orbit no fewer than five times: In 2012, 1976, 1917, 1881 and 1845. Take note that most of these perturbations are separated by intervals of 36 years, the equivalent of three revolutions around the sun by Jupiter. Many comets and asteroids swing around the sun in orbits that are simple multiples of the orbital period of Jupiter, the most massive planet in the solar system and the biggest disturbing influence on cometary orbits. Comet 209P/LINEAR is no exception to this rule. For every three revolutions of Jupiter, comet 209P/LINEAR makes seven, and the same relation probably holds true for the dust particles released by the comet. These dust particles therefore have average orbital periods very close to that of the comet, and might be kept in step by the influence of Jupiter; they avoid spreading out as a result of a dynamical process known as resonance, analogous to the mechanism leading to the fine structure seen in Saturn's rings. For an analogy, consider a pool table with balls in a rack. When the rack is lifted, the balls slowly scatter, representing what happens to the dust particles released into space by the comet. But when the comet and its accompanying particles pass near Jupiter, the big planet "re-racks" the particles, bringing them closer together again. Resonance then, is the wild card for our upcoming meteor display. It can mean the difference between a mildly entertaining meteor shower and a very exciting one. If the dust particles shed by Comet 209P/LINEAR are drawn together thanks to repeated passages by Jupiter, we might be treated to many hundreds of meteors per hour. Regardless of just how many are seen, the meteors are likely to bright and very slow moving. They'll be bright because computer simulations suggest the comet's trail of dust should be skewed toward relatively large particles, possibly leading to some outstandingly bright fireballs. And they'll be slow because the meteors will hit the atmosphere at a mere 40,000 mph (64,000 km/h), so they'll appear to move slowly and majestically across the sky — far more slowly than the Leonids and Perseids. Finally, moonlight will be a minor hindrance at most. The moon is a waning crescent 4 1/2 days from now, just 20 percent illuminated, and it doesn’t rise until around 3 a.m. So hope for fair skies, plan your observing site and be ready for whatever happens in the early hours of Saturday morning. Nobody knows what will happen. Only two things we can say with certainty: The skies will be dark and the meteors bright.